No doubt many of you are aware of Monster Hunter Stories, the kid-friendly RPG spin-off of Capcom's popular Monster Hunter series. The game's done pretty well in Japan, but there's still no word on whether or not there will be a Western localisation. 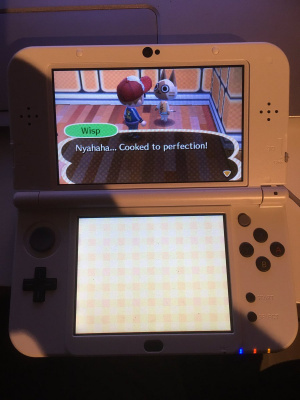 Though Capcom has remained fairly tight lipped about this, the recent update to Animal Crossing: New Leaf has stirred up discussion over whether an announcement may be forthcoming. The new Animal Crossing update added in amiibo integration, and the three Monster Hunter Stories amiibo are on the list of compatible figures. Though these amiibo are currently Japan-only, Western gamers that have imported the figures have found that they're compatible with English copies of New Leaf, complete with localised text. It's far from a confirmation that Monster Hunter Stories is coming West, but still, we can dream. What do you think? Have you tried this out for yourself? Would you like to see Monster Hunter Stories in the West? Share your thoughts in the comments below. I was hoping Splatoon and Zelda wouldn't be the only ones with villagers, and that the Felyne would return somehow. Does Roy unlock anything? I mean, the guy is the best looking amiibo for me but he's useless aside from Smash and other games where every amiibo unlocks something insignificant. Well even if they don't plan to make them available over here, it's definitely better than completely disabling their functionality. Like with the extra NES games in the GameCube game. @roy130390 He's an exclusive character in Code Name Steam. Can't get him any other way along with other FE Amiibo. Unless the game got an update I missed, Roy doesn't do anything in codename steam. Only Ike/Lucina/Robin/Marth do. Roy does nothing outside of smash currently. @Linkstrikesback And here I though all the FE characters did something in that game. I want to play Stories so bad!! @Spoony_Tech Marth, Ike, Robin and Lucina all do something in that game. Roy was released after the game had been out for a very long time and was never patched in. @Spoony_Tech At the time all the currently available FE Amiibo were indeed usable in that game. But they never patched Roy in after he was released. Roy gets no love sadly. I doubt this means anything. It's probably easier to translate a few lines of text then it is to remove this feature from the game. Plus there's no reason or need to remove it. Plus I can use my Silver Mario amiibo in games despite it not being sold in Europe. A Western MH Stories would still be awesome though. Are mega man and ryu usable In monster hunter stories? Unfortunately, Japanese sellers seem to be including the postage price in the total purchase price rather than splitting the two. Anything over £15 attracts an £8 processing fee and a 20% import tax. Quite a big addition. If only they'd split the postage. Apologies my nintendo brethren if this sounds like a stupid question... but how do I use amiibo following the patch? Can I only scan them when talking to Wisp? I've done that, but I read somewhere that apparently it will also make certain characters appear in the campground and nothing seems to be happening. I did try and find some info online but I'm still none the wiser! So, by using Monster Hunter amiibos, those villagers can become permanent villagers if we convince to stay in your town ? What is his/ her name ? There is still no official list of villagers by using those amiibos. Oh, excelllent! I imported the male and female hunters a few weeks ago, but the only use they've gotten do far is scanning random goodies in Hyrule Warriors. I'm definitely using them in Animal Crossing now! Did anyony confirm if smash-Villager unlocks....OG Villager? Also, behold those ips screens. Behold.